The number of international graduate students at MIT declined this year by three percent, consistent with a nationwide trend of lower enrollment of foreign students at top U.S. universities. According to the Registrar’s Office, the number of international students has been dropping since the 2001-2002 school year from an initial number of about 2,500. One reason for the decline may be that “America feels less welcoming to internationals,” said Dean of Admissions Marilee Jones. She said that internationals may not agree with policies regarding the war in Iraq and that visas have been harder for students to obtain following changes in U.S. policy. In addition, an increase in funding and programs offered by other countries such as England and China have made these programs more attractive than before, drawing students away from the U.S., Jones said. Number of int’ls varies by dept. The Department of Civil and Environmental Engineering experienced the sharpest drop in international graduate students, a decline of 19 percent compared to last year. In the Departments of Nuclear Engineering, Ocean Engineering, and Aeronautics and Astronautics, the number of international students decreased by approximately twelve percent. However, Peggy Carney, an administrator in the Department of Electrical Engineering and Computer Science, said that the percentage of international students in the department had increased from twenty to thirty percent over the last ten years. 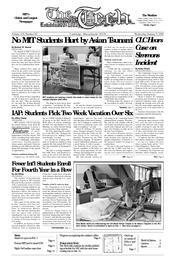 Although the number of foreign students nationwide has been on a steady decline, administrators in the Departments of Chemical Engineering, Physics, Electrical Engineering and Computer Science, and Mathematics said that foreign student enrollment has not been greatly affected by the terrorist attacks of Sept. 11, 2001. Students have experienced delays, but none were barred from admission. Suzanne E. Easterly, academic administrator in the Department of Chemical Engineering, said that no foreign graduate students accepted to MIT in her department were denied entry into the U.S., but a few were delayed by visa problems. Brian E. Canavan, the academic administrator in the Department of Physics, said a “small handful” of delays occurred because of the short period between when foreign students are accepted and when they arrive. Countries such as Russia, China, and Germany have slow visa clearance processes, he said. Consistent with previous years, the percentage of international students in the department remained at 50 percent. Sixty percent of the graduate students in the mathematics department are international students. Associate Mathematics Professor Pavel I. Etingof said that students from Iran, Russia, Pakistan, and China have experienced visa troubles, resulting in arrivals as late as October. Some students choose not to return to their home country over the summer for fear of not being able to return.